Catherine Mayes is “unbelievably thankful” that she got her babies out of the car in time. She is pictured here with her sons Tommy (21 months), Hunter (five months) and partner John Stasik. Photo: George Tsotsos. 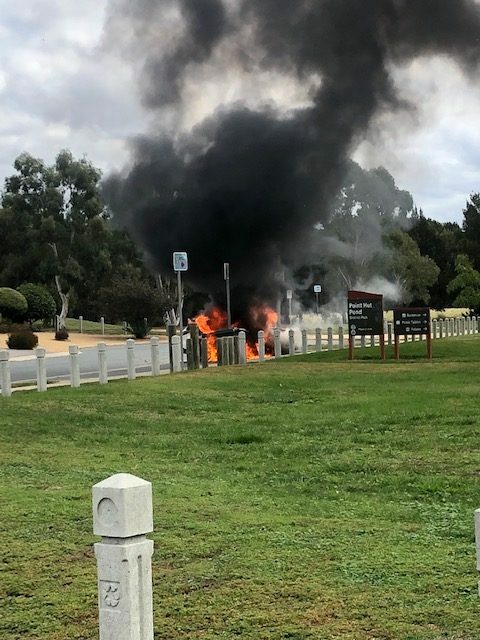 In a heart-stopping rescue, a Canberra mother saved her young sons from a car seconds before it exploded into flames in the car park outside Gordon Adventure Playground on Friday afternoon (April 5). Quick-thinking Catherine Mayes is still recovering from shock today as the realities of what could have happened sink in. 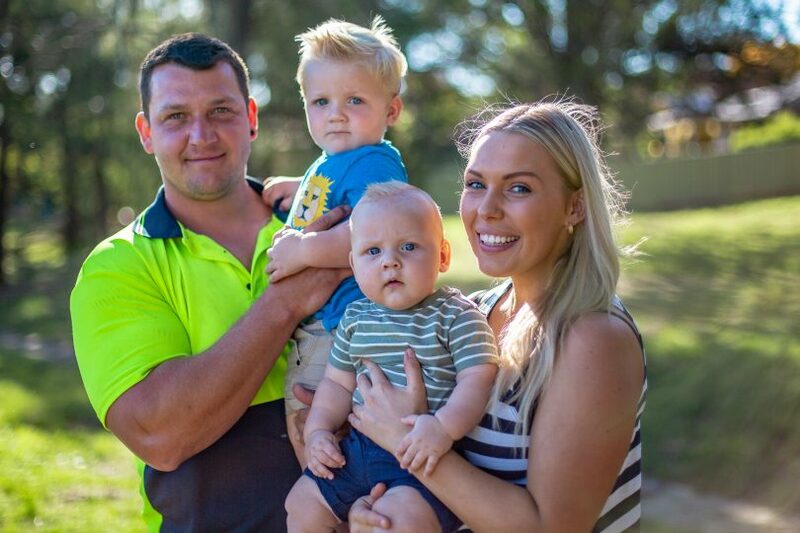 Her heroic rescue of her young sons, Tommy (21 months) and Hunter (five months) was captured on CCTV security footage from a nearby townhouse and highlights how close a call it was. 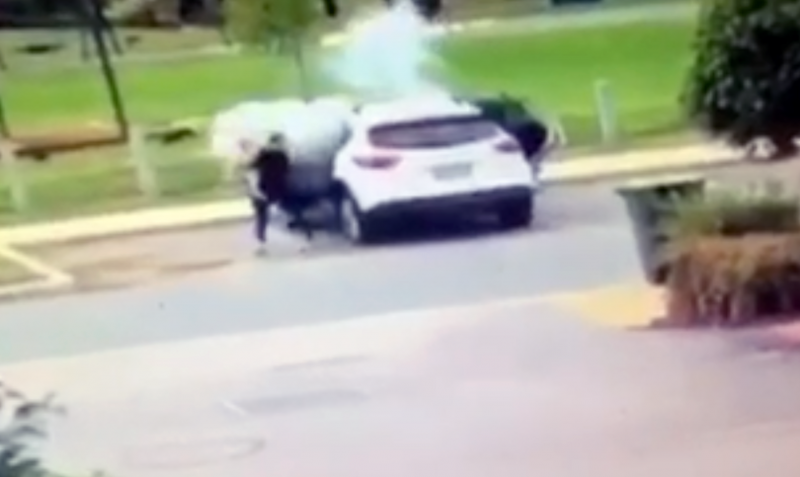 A Canberra mum is shown saving her babies from a car only seconds before it explodes in flames in the car park near the Gordon Adventure Playground on Friday (May 5). The CCTV came from the security camera of a nearby townhouse. 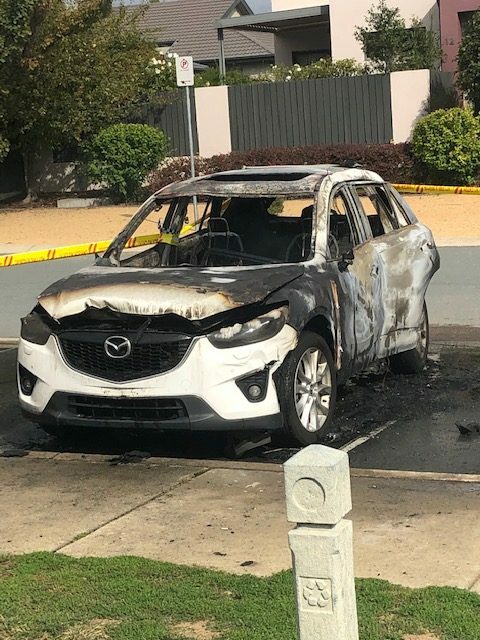 The fire is believed to have started from a portable battery pack (used to jump-start the engine) in the front passenger seat, which popped open and began to ‘fizz’ at the same time as Catherine and the boys pulled up near the playground around 3 pm. The car then quickly filled with smoke. In a split second reaction, Catherine realised the danger and rapidly pulled Tommy and then Hunter from the car, having to put Tommy down and spend precious seconds releasing Hunter from his rearward-facing baby seat. She then frantically dragged the boys away to safety. While holding Tommy, Catherine Mayes tries to rescue five-month-old Hunter from the back seat of the smoking car, which goes up in flames a minute later. The image is a still from CCTV footage of the incident. Catherine told Region Media that there would have been no more than a minute between when she dragged the boys from the car and it exploding in flames. Catherine said that all she could think about was that she just had to get the kids out of the car. 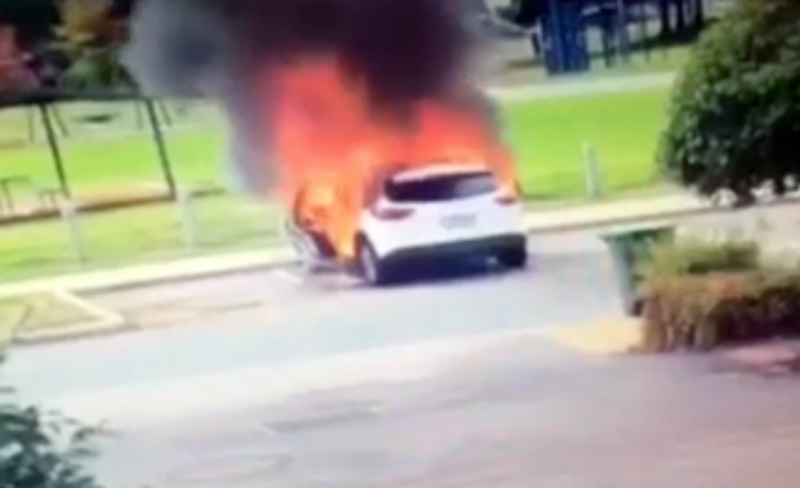 “All I could think is ‘this car is about to explode’,” she said. 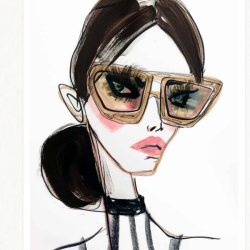 Catherine had bought the portable Boxo battery pack because she’d been having problems with her car battery and had used it to jump-start her engine on Friday afternoon in order to take her sons to the park. She said that as soon as she pulled up and parked near the playground, the battery pack popped open and made a fizzing sound. Soon afterwards it exploded, filling the car with smoke and then catching fire, with a lot of noise and the car windows smashing. A fire engine arrived and tried to extinguish the flames but the car, a Mazda CX-5, was completely burnt out. Catherine feels that she and the boys have escaped death. “This could have been life-ending,” she said. Catherine said it is hard to imagine what might have happened if she’d been at a service station or driving down the Clyde at the time the battery pack exploded. She has been having trouble sleeping since the incident, just picturing what could have happened to her boys. Catherine said that people have been telling her that she is a hero but she thinks she just did what any parent would have done – saying that it is her job to look after her children. Thankfully, the boys do not seem to have been impacted by what happened. Catherine said they had no idea what was going on and afterwards Tommy still just wanted to go and play in the park. Jeepers – that could have been a such terrible disaster.